When Black & Decker merged with Stanley we knew there would be some changes, but we had no idea Stanley, which is known for their hand tools, would be all but replaced by first Bostitch, and now DeWalt. But in fact the news is true; the DeWalt name will soon be found on a number of hand tools. DeWalt and hand tools just seems odd to me, but I am sure B&D has a plan. I guess it would help DeWalt if their yellow tools out numbered the other tools in one's tool bag; after all, we often buy the same tools our coworkers own. DeWalt will be offering over 100 products in their hand tool line, so it is probably safe to say that many of them will be the same or very similar to what Stanley was offering. But they do have some new goodies as well, including a 15 Ounce Framing Hammer DWHT51138 ($59.99) , a 1.25 inch, 25 Foot Short Tape DWHT33385 $24.99, a Power Tool Case with Tote DWST24070 $25.00, a Folding Retractable Utility Knife DWHT10035 ($9.99) and multiple Heavy-Duty Adjustable Wrenches ($10.99 – $34.99). You will start seeing these tools in stores starting in June. If you are hungry for more details, check out the press release after the Read More. TOWSON, Md. (April 5, 2011) – DEWALT announced today the launch of its new line of hand tools, which will be available beginning in June 2011. The line includes more than 100 professional-grade products including utility knives, pliers, wrenches, tape measures, hammers, saws, toolboxes and more. Professionals trust DEWALT products because they are optimized to perform tough under real life conditions. Now, for the first time ever, contractors will benefit from a complete line of DEWALT hand tools and storage products that will increase productivity and meet jobsite demands. "DEWALT is known for manufacturing professional power tools and accessories that are driven by field research and countless conversations with contractors," said Tracie Gildea, director of global brand marketing. "Our new hand tools are no different. They have been rigorously tested on jobsites across the country and incorporate feedback we've received from the people who use these tools every day to earn a living. Based on our research and the testing these products have endured, we are confident DEWALT's first line of hand tools will live up to even the toughest standards." Among the more than 100 products offered in the line, five of the most innovative tools include a 15 Ounce Framing Hammer (DWHT51138), a 1.25 inch, 25 Foot Short Tape (DWHT33385), a Power Tool Case with Tote (DWST24070), a Folding Retractable Utility Knife (DWHT10035) and multiple Heavy-Duty Adjustable Wrenches. The framing hammer is the world's first 15 ounce all-steel MIG Weld framing hammer. It touts a surprisingly lightweight design, but it can deliver the power to handle almost any professional wood framing applications. This hammer provides contractors with the strength and durability they need to maximize their level of productivity, and it helps to minimize arm fatigue. The 25 foot short tape helps deliver durability for contractors. A patented technology, using a specially designed 3M Thermoplastic film adhered to the first six inches of the blade, extends the lifespan of the product compared to competitive units without the technology. The new tape was also designed with a durable casing and rubber slide lock that can withstand the daily rigors of jobsite abuse. Additionally, this tape offers 13 feet of standout* and includes an end hook that is larger than traditional end hooks. Both of these features enable professionals to work alone in situations where other tapes fall short. The power tool case with tote is a two-in-one tool box that provides contractors with a portable storage option for tools and small accessories. This storage solution allows for power tools, hand tools and small parts such as drill bits and nails to be organized in the power tool case. For internal storage customization, the tool case has a removable divider that stores larger items in the bottom of the tote, helping to eliminate the need for multiple tool bags. The utility knife is one of the first hybrid folding retractable utility knives of its kind, combining the convenience and space savings of a folding knife with the cutting performance of a traditional utility knife to create an all-in-one solution integral to any contractor. Available in five sizes – 6 inch, 8 inch, 10 inch, 12 inch and 15 inch – the heavy-duty adjustable wrenches offer contractors a solution that can tackle nearly any professional wood framing, decking and plumbing applications. The adjustable wrenches are stronger than the leading competitor on the market and offer durability that contractors can count on to move from one task to another quickly and efficiently. 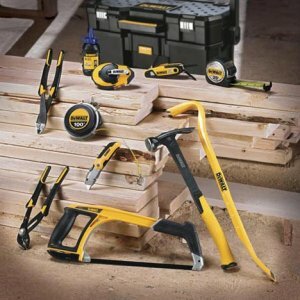 Complete with a limited lifetime warranty and a service network unmatched in the industry, the new line of DEWALT hand tools will be available at The Home Depot as well as independent distributors beginning in June 2011. The five featured products listed above are expected to retail as follows: Folding Retractable Utility Knife ($9.99), 25 Foot Short Tape ($24.99), Power Tool Case with Tote ($25.00), 15 Ounce Framing Hammer ($59.99), and Heavy-Duty Adjustable Wrenches ($10.99 – $34.99). * Standout claim based on maximum performance.